Sunday is Pasta Night at our house. 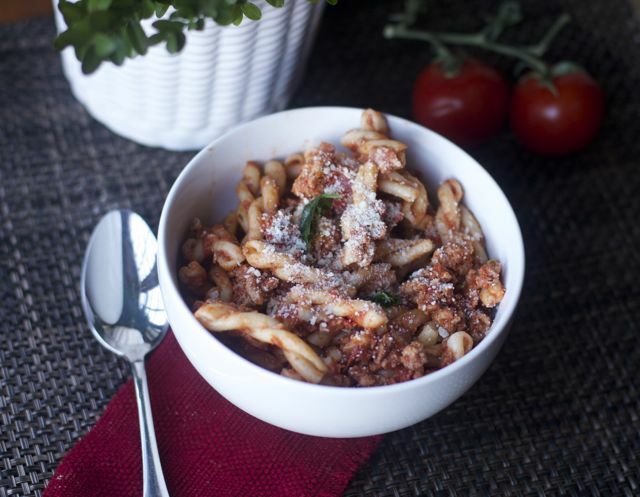 Here is a great Pasta Night Recipe: Bolognese Sauce Recipe: Bolognese Sauce. I know it may be hard to believe but I have only made a meat pasta sauce a few times in my adult life and it was with turkey meat. A friend of mine had said she was served this recipe at a friends house and really liked it. Of course, with my obsession with everything Ina, I was excited to try this. 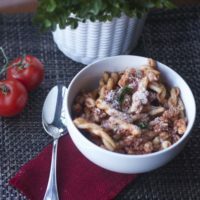 Easy Bolognese Sauce is perfect for any weeknight meal and you could even cook the Bolognese Sauce in the morning or night before and just heat up for dinner as you boil the water for the pasta. 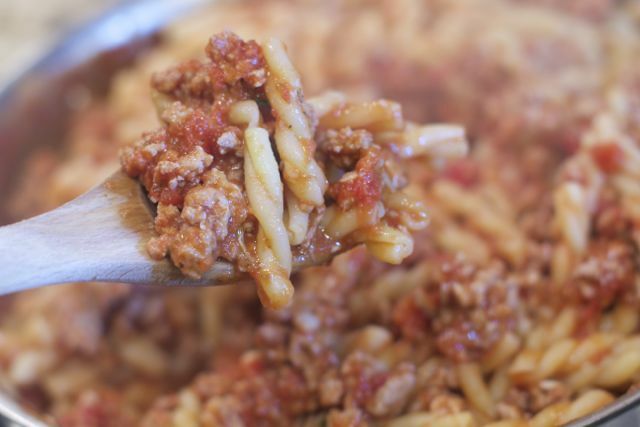 There are no fancy ingredients to this pasta dish and I have made it with both Ground Beef and Turkey. Turkey definitely gives it a different flavor but my family is used to me substituting the two. I used a penne pasta as out base but any short noodle would suffice. Another trick I have learned from my years of watching cooking shows is to add the pasta to the pan you are making the sauce. 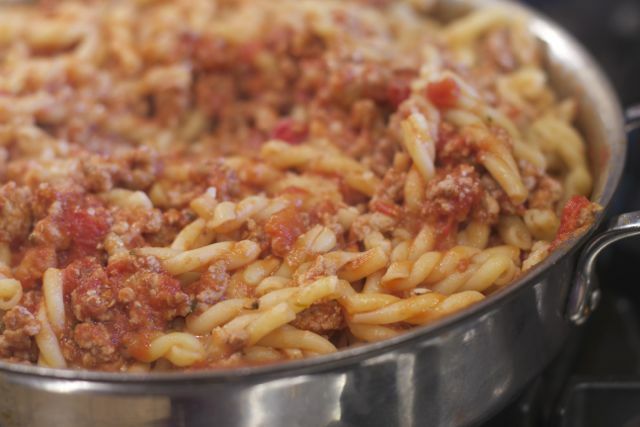 Not only do you have one less dish to clean as I serve it in the pan, but also the pasta will cook a little more and absorb the warm sauce or gravy! The kids liked it but I think they have gotten so used to my all tomato versions that they were a little surprised by the meat. 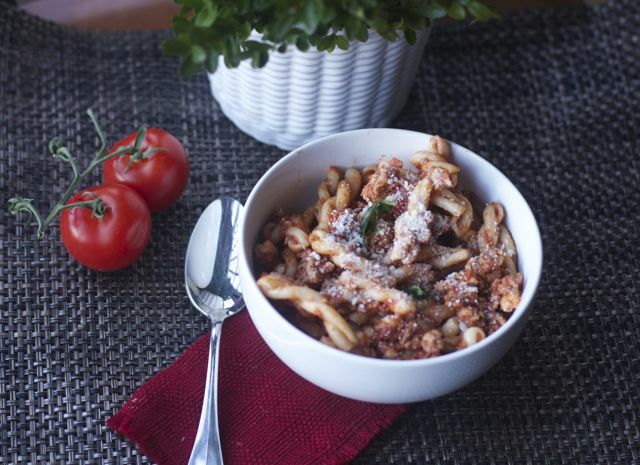 The result was a rich and thick Bolognese Sauce that warmed our bellies. Serve this right in the pan you cooked it into for easy clean up. I told you there is no secret to this sauce and you don’t have to have your gravy on the stove all day! Add a little red wine and a green salad and you have hit all the necessary food groups. Tomatoes and grapes are a fruits! 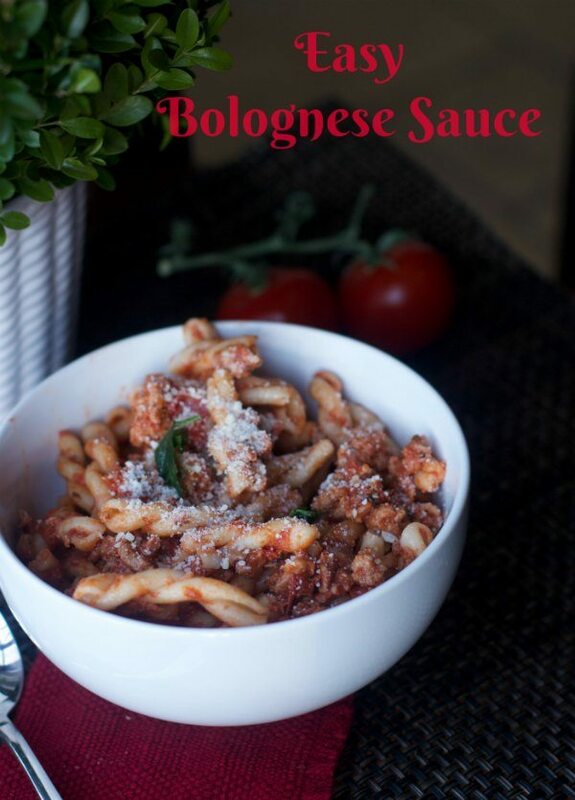 Find this Easy Bolognese sauce and other great recipes in the book: Barefoot Contessa, How Easy is That? Heat 2 TB of olive oil in a large (12 inch) skillet over medium-high heat. Add the ground beef or Turkey and cook, crumbling the meat until the meat is no longer pink and has started to brown. Add the garlic, oregano, and red pepper flakes and cook for 1 more minute. Pour 1 cup of the wine into the skillet and stir to scrape up any browned bits. Add the tomatoes, tomato paste, 1 TB salt, and 1 ½ tsp pepper, stirring until combined. Bring to a boil, lower heat, and simmer for 10 minutes. Meanwhile, cook the pasta according to the directions on the box. Finish the sauce while the pasta cooks. Add the nutmeg, basil, cream, and the remaining ¼ cup wine to the sauce and simmer for 8-10 minutes, stirring occasionally until thickened. 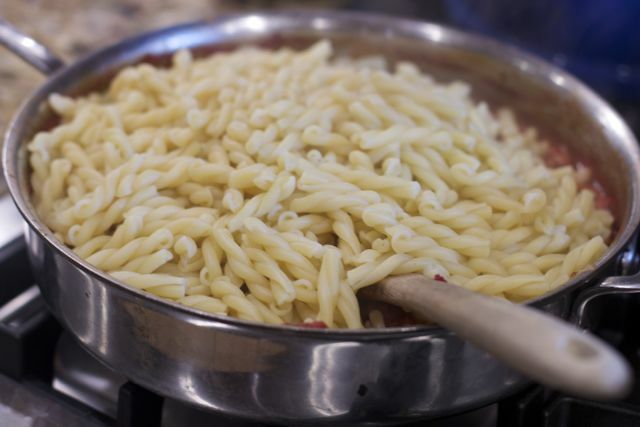 When the pasta is cooked, drain and add it to the pan with the sauce. 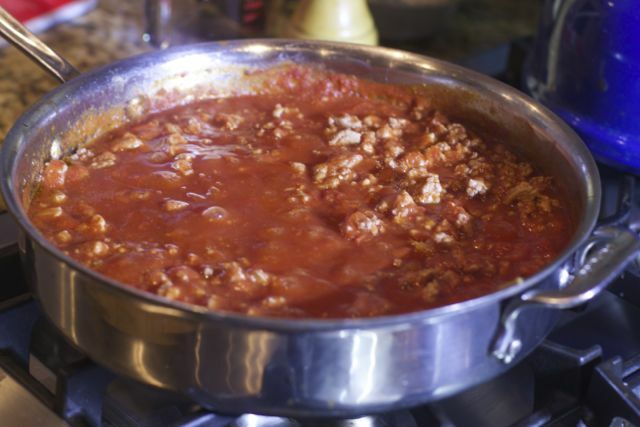 Have you ever made a Bolognese Sauce ? 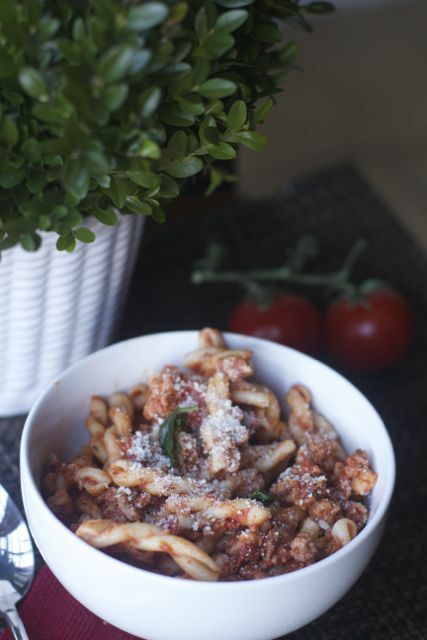 Be sure to Pin this for your next Pasta Night Dinner! 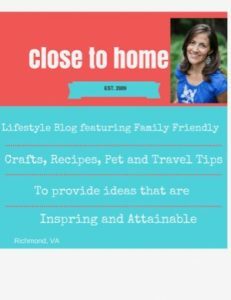 Jovita what do you do differently than this recipe? Great dish for our pasta night. I love the type of pasta pictured. What is it? Bolognese sauce is favorite in our house. So hearty! Mmm, If I could I taste it through this computer!!! I love Bolognese. That’s my most favorite pasta sauce ever, hands down. Thanks for the easy recipe!